Meta: Fish are like humans. They can be affected by some diseases. Knowing the symptoms and diseases is crucial for those who want to keep their discus healthy. Are you maintaining discus fish? If the answer is yes, your discus might be one of the essential living things in your life that you need to keep healthy. 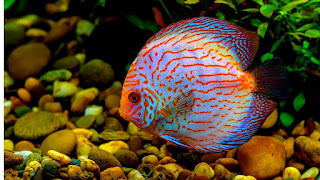 Like any other fish, discus are prone to several types of diseases since they are sold or imported from people to people who might not keep their cleanliness. Here are some most common types of discus fish disease and how to treat them. Rapid breathing, tipsy, leaning on the side, and bloat or swollen belly are symptoms of discus fish disease. If you recognize your discus fish disease from the rapid breathing, they could be poisoned by ammonia, nitrate, chlorine or chloramine. Besides, it also a sign that there is less oxygen in the tank. To solve this problem, you can start to drop an air stone into the tank and rise the oxygen levels. You can do a water test by using an aquarium test kit to read the existence of ammonia or nitrate levels. This disease rarely affects discus fish. However, when your discus are showing this symptom, it could be a sign of poor water quality. Use a test kit to check your water quality. Having known the source of disease, you can do a water change with pedaled water. It occurs when your discus are laying down in the aquarium. This could be a sign that something more serious happens. The source of this problem might come from discus fish movement from a bag to a wide aquarium. This condition could make the discus get much pressure. Hence, you need to push them in the bottom of the aquarium. This problem is commonly caused by overfeeding. To treat the symptom, you can remove discus and set them into a smaller quarantine tank. All in all, keeping your discus healthy is essential since discus is also one of the living things which need to be given more attention in order to grow well.